Local McDonald's business manager Cheryl Carter with Ryhall Under 16s. Ryhall United FC Under 16s are celebrating after receiving a stylish new kit thanks to their local McDonald’s restaurant. The Eye Green restaurant on Crowland Road has donated kit to the team as part of the McDonald’s FA Charter Standard Kit Scheme, which is now in its second year. The Ryhall Under 16 team are delighted to be benefitting from the new community programme which, run in partnership with The FA and their official kit supplier Nike, enables all 4,600 FA Charter Standard clubs with a junior team in England the chance to order a new strip every year for the next three seasons. The scheme will distribute over 250,000 kits nationwide – more than 150,000 of which are in England, and aims to help raise the standards of grassroots football for young aspiring footballers. Franchisee Matt Jarrett owns and operates the McDonald’s restaurant outside Eye Green. As part of the McDonald’s FA Charter Standard Kit Scheme he helps to support grassroots football clubs across Peterborough. 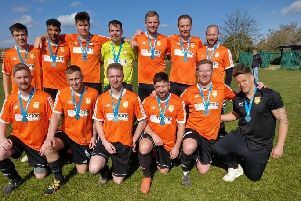 “Grassroots clubs such as Ryhall United FC invest an incredible amount of time providing their local communities with footballing opportunities,” he said. “They provide young people with the chance to get involved and feel part of a team. It’s important that businesses like McDonald’s support clubs such as Ryhall United as it means they can use the money saved by the kit and equipment to invest in training more coaches, improving facilities and reducing the costs passed onto players and their parents. To find out more about how McDonald’s and The FA support community football, visit www.mcdonalds.co.uk/BetterPlay.